Our mission is to make the highest quality products possible. In order to achieve that goal, we are continually searching out the best ingredients to use in our recipes. 2) Christmas fruitcakes and shortbread cookies. Along with a group of dedicated and conscientious employees we have made as much as 300,000 pounds of Christmas products annually. Our Christmas cakes are sold mainly in Eastern Canada, and our regular bakery products can be found in our local region. We are notorious for supplying numerous community service clubs with fruitcakes and cookies for their fundraising campaigns. Our retail outlet is open to the public from Wednesday through Saturday (please consult our store hours) and offers a wide selection of our products daily. Thank you to all our loyal customers for trusting our products to feed yourselves and your families. We sincerely appreciate it! 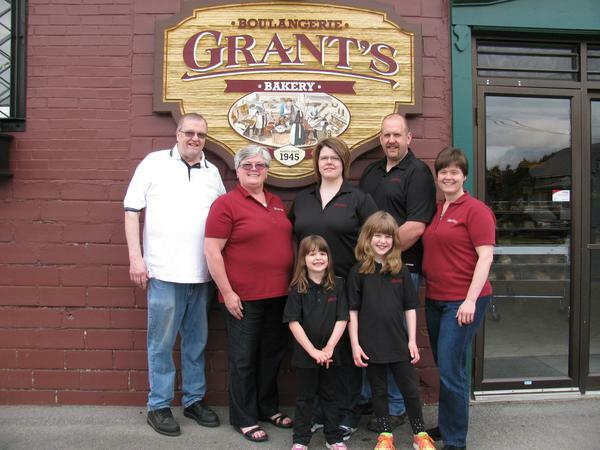 Grant’s Bakery was first opened around 1929 by Henry Grant in Lennoxville, QC. It was closed and relocated a couple of times before finally settling on Huntingdon, QC. The many and various challenges posed during the 1930s through the mid-1940s were overcome through the capacity for adaptation, including when baked goods couldn’t be prepared due to supply deficits and rationing. In 1945, Henry’s two sons Charlie and Gordon formed a partnership and firmly established the business as 2nd generation bakers in a building behind the family dueling at 32 Hunter St. Bread, rolls, donuts, pies, pastries and sweet goods were the major portion of sales. At that time, a loaf of bread sold for about $0.05-$0.07 and was packed in a cellophane overwrap. 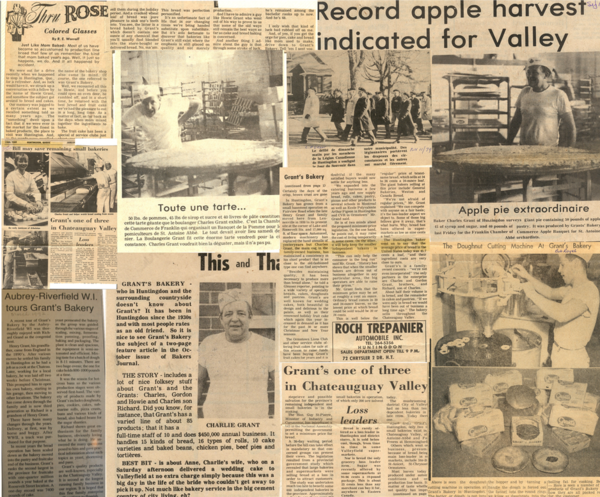 As times changed and business grew, in the late 1960s, the bakery needed some larger equipment which increased space requirements, so, operations were moved to our current location at the corner of Wellington and Roosevelt streets. At around this same time, Charlie’s son Richard showed potential in carrying on the baking family tradition and eventually became its 3rd generation baker. He is still the current proprietor after enjoying 50+ years in the business. Today, we are one of the largest producers of fruitcakes in Canada and at one time included Eaton department stores as one of our customers. In addition to our the hard work and capacity for adaptation without sacrificing quality and service, our family business’s recipe for success would not have truly been possible if the men hadn’t had the support of their wives who took care of the office tasks and the book keeping. Grant’s has always been and continues to be a family run initiative. A votre service depuis près de 65 ans!